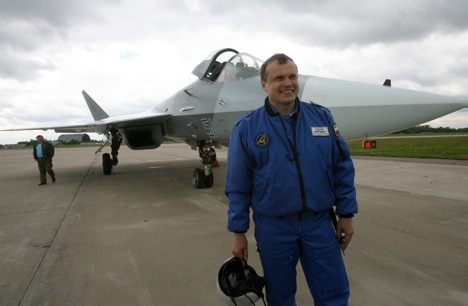 Sergey Bogdan, Hero of Russia and Sukhoi test pilot, who flew the Su-35 at the Paris Air Show, talks to Ogomyok about the aircraft and the state of aviation engineering in Russia. The display sequence you flew in the Su-35 left the impression that the aircraft is weightless: it can stop in mid-air and descend in circles, sailing like a leaf on the wind. Is this fighter as easy to fly as it would appear from down below? I love the Su-35, not least because I had the pleasure of being the first pilot to take it into the air. Its control system is awesome. In fighters of previous generations, as the aircraft loses airspeed its controllability often deteriorates, causing it to stall into a spin or inducing wing flow separation. With the Su-35 you can forget about such problems. This aircraft can halt to a stop and slide down tail-first while fully responding to the pilot attitude inputs. The Su-35 is capable of previously unheard-of manoeuvrability. Did you manage to fully demonstrate the fighter's potential at Le Bourget? The Su-35's primary characteristics are impossible to demonstrate at an air show for obvious reasons. A fighter's primary advantage lies in its combat performance. Here are some figures for you: the Su-35 exceeds any other fourth-generation fighter in operational effectiveness by 40 percent. For a number of parameters it is 10 percent better than the [existing] fifth-generation fighters. The air forces of Malaysia and India regularly stage exercises involving Russian-made combat jets; our aircraft invariably come on top in all air-to-air combat scenarios. Do you have gifted apprentices among test pilots? There was a period when Russian military flying schools, including the most famed of them such as the Kacha and Borisoglebsk schools for pilots (I am a graduate of the latter), massively cut back on their cadet intake and dramatically reduced the flying hours. Making a truly high-class pilot requires some seven years of on-the-job training after graduation. It is also important to have a pool of flying officers to choose from because modern aircraft designs require talented pilots at the controls. As the commander of the Sukhoi's flight testing service I have been blessed with brilliant students. We have seven active pilots on the team; six of them are already current on the [T-50] fifth-generation fighter. The seventh has fallen behind somewhat owing to frequent field trips but he will catch up soon. Each of these men is capable of flying the sequence I demonstrated at Le Bourget. Your flying career began in the 1990s, a very difficult period for Russia's economy. How did you manage to stay on in this trade? I was plain lucky; I got enrolled with the test pilot school, which offered intensive flying despite the overall problems of the Russian Air Force. The workload was quite high: sometimes I would get to fly five different types in just one 6- to 7-hour shift. I still remember how difficult it was for me to do my first carrier landing, with the flight deck heaving and rolling under me. In your opinion, which sectors of Russian aviation engineering require special attention? Our fighter aviation is currently in top shape. It would be great if we could keep it at present level while stimulating the development of new aircraft designs. Our greatest concern is commercial aviation. When I see an Airbus A380 for example I wish this aircraft had been designed in Russia. We need to establish a presence in this critical niche because achievements in commercial aircraft construction are essential to a country's image in the international arena. First published in Russian in Ogoniok magazine.